Kathy Gilberd in front of her roses. 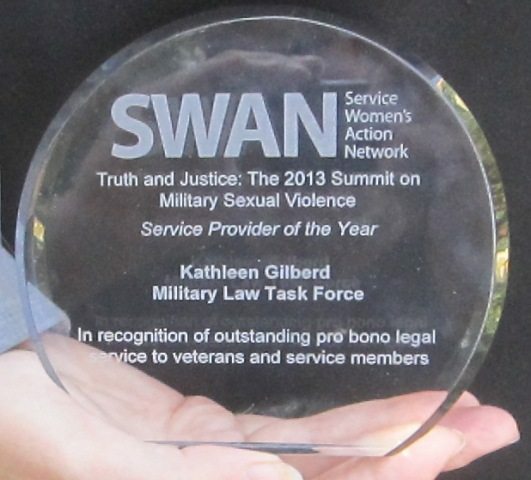 Kathy Gilberd – a counselor for the Military Law Task Force here in San Diego – has just won an award from a national military women’s advocacy group, SWAN – Service Women’s Action Network. 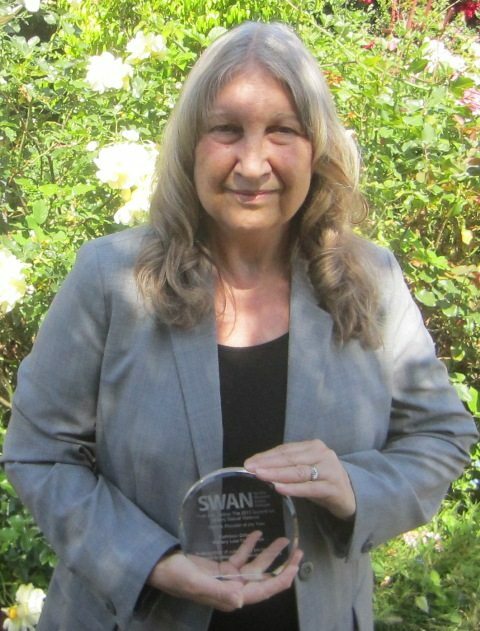 SWAN was formed several years ago by ex-military women and supporters, and now is the lead national group doing work around women’s issues in the military especially around sexual assaults and sexual harassment. The organization takes women’s cases, and also does lobbying and policy work, and public education. The awards were presented during SWAN’s 2nd annual summit in DC. Gilberd’s Military Law Task Force is a national committee of the National Lawyers Guild and does work with military vets and others with problems related to the draft and registration. She does daily counseling on discharges, upgrades and complaints around procedures and grievances. She works part time for the Task Force – and actually puts in twice the time she is paid for. Kathy has been the executive director of the Task Force for two years and worked as its staff for another three. She has worked as a volunteer for the organization since 1977. The National Lawyers Guild has been around since 1937 and is a national progressive bar association dedicated to the proposition that human rights are more important than property rights. 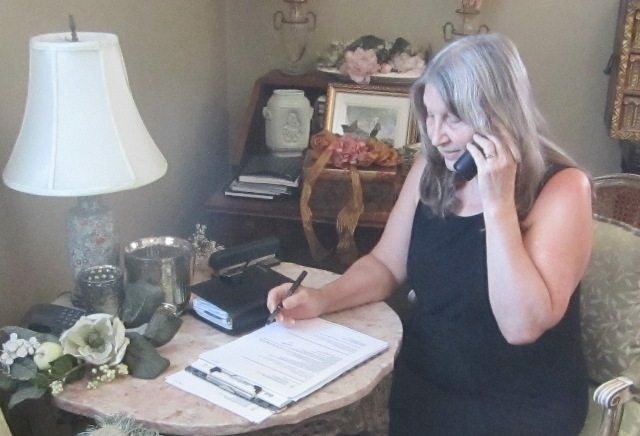 Gilberd also is a contract legal advocate for vets and others, and can be reached at 619-463-2369. She’s been involved in military counseling in San Diego since 1972, during the end-days of the Vietnam war. Her work is particularly important now since the Pentagon just released a study that shows increased sexual assaults and sexual harassment of women in the military and that the rates have significantly risen – despite all the “education” and sensitivity training the different branches of the armed forces provide. Kathy deserves this award and much, much more. People who have worked with her know how brilliant she is (though she’ll deny it) and how very valuable her contributions have been to the causes of human rights, peace and social justice. She’s one of San Diego’s treasures! By the way, in addition to all of Kathy’s work described in Frank’s article, she also serves on the community advisory board of Project YANO, a leading counter-recruitment organization that is based in San Diego County (www.projectyano.org), and she contributes excellent articles to Draft NOtices, published by Commitee Opposed to Militarism & the Draft (www.comdsd.org).